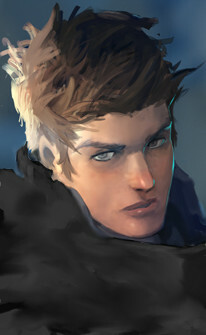 The young man's dark brown hair is short and wavy, and his grey eyes resemble the textures and colors of storm clouds. Though his face is expressive and open, his animal-like gaze often lingers. He is of average height, and a lean build, and his movements are fluid and natural. He has, on his left forearm, a tattoo in the shape of intricately arranged symbols. Often respectful and curious, Rysen is a seeker of both knowledge and experiences. He is thoughtful and reflective, but wears his emotions on his sleeve, which often shatters plans and expectations in the heat of the moment. He seeks to earn honor and glory in the arts of war and poetry, but knows that he has much to learn, and is more at home in the country inn or wooded glade, than the glittering halls of court. Rysen was born the second son of a distant Crovane lord. His mother is a devout follower of the Faith, and educated her sons on religious matters, court poetry and the practice of virtue in everyday life. He was also trained by Grodin Vales, a veteran soldier of the north who taught him marital skills and survival techniques. After becoming seriously wounded in an altercation with an influential priest rumored to be a relation of his lover, Rysen was sent by his father to Arx.